Sometimes the simplest of ideas work surprisingly well. Yamishibai: Japanese Ghost Stories (or Theater of Darkness) is essentially the animated equivalence of telling spooky stories by the campfire. Of course, unlike campfire ghost stories, it has the advantage of telling its story through visuals and atmosphere setting sound design. This is as rudimentary as storytelling gets, short and quick to the point. Yet these tales of horror are plenty effective; distilling the tense atmosphere and shocks which make those short ghost stories so much fun. Yamishibai wholly commits to creating a creepy atmosphere from beginning to end. The short opening for every episode has a man in a creepy mask telling a bunch of pale, lifeless looking kids with bloodshot eyes at a playground to gather round and listen to his story. The colour palette is all grimy, dank, and subdued. Lighting is used to ominous effect, casting shadows and shining at discomforting angles. Ambient noise and a few musical tracks create tension very efficiently. The show does a good job building up to the inevitable jump scares in every episode, which is surprisingly effective given how prevalent they are. You could probably have a seminar on how to properly do a jump scare using this show. To say that Yamishibai is animated is a bit of a stretch, actually. Fluid motion is pretty much non-existent here, and characters mouths don’t even move when they talk. It isn’t done in the traditional animation, instead much more like an elaborate puppet show of sorts that uses paper cutouts. Oddly enough, this doesn’t hurt the show, and in fact, it even works to the show’s benefit, although it makes quite clear that there wasn’t much of a budget behind this project. This style gives the show an almost other-worldly feeling that helps the scares along, as they might have come across as trite in a more traditional animation style or live-action. The constantly on-edge voice work and ominous use of sound complete the creepy package. With all this said, Yamishibai is undeniably a one-trick pony. The only thing the show actually accomplishes is the effectively creepy atmosphere. The stories themselves are, frankly, unremarkable. Yes, they are steeped in Japanese occult lure, which is interesting, but that is it really. They never give much of an explanation and ultimately don’t leave any sort of impression. The stories all follow essentially the same formula, and so can be very predictable. Some are outright silly, most notably an episode that features a poop monster, and are only saved through the show’s effective atmosphere. This is excused by the fact that these are short episodes with run-times no longer than 5 minutes, but it is clear that Yamishibai is as narrow in scope as a show can get. 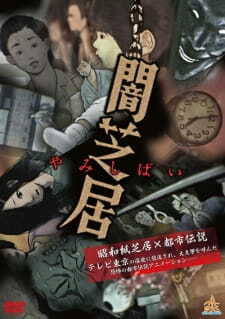 Minimal ambition aside, Yamishibai is a fun little taste of the macabre. All things considered, it is a nice little collection of creep shows. It isn’t a big time commitment only spanning 13 episodes, roughly around an hour with the short running time of the episodes. It’s a good little time-waster to watch in the dark.